So issued an invitation to exhibit in a way that was, well, with all due respect to the creature, ferrety. The FERRET exhibition encompasses a group of 50-60 artists. Apparently, the correct collective noun is a business of ferrets, but better still is the medieval busyness of ferrets. It’s appropriate as this exhibition brief is for the ferret artist to, like the animal, ferret-out a space and then make a work within it or alternatively, to take an existing work into the space and in the process of installing it, respond not only to the architectural site itself but also to a busy cyclical progression of artists and works moving around – both behaviours analogous to nesting within a communal ecosystem. FERRET 1 (26 – 28 January) shares the site briefly with FERRET 2 (26 - 28 January), then FERRET 2 and 3 mingle (2 – 4 February), and so on, until the final FERRET 5. Five consecutive Friday openings between 26 January and 23 February will provide five focal points of convergence between the various groups. In between openings, artists and works will come and go, like a tide receding and returning with new offerings. Similarly, for visitors, your experience of the exhibition will either be of a singular fragment in chronological time, or if you return provide an embodied experience in which memories of prior works will become overlaid with experiences of new ones. 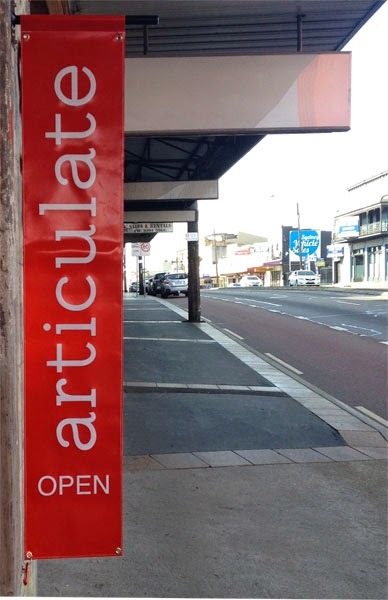 Articulate project space provides a unique and ideal site for this progressive exhibition project. In its conversion into a white-walled gallery space the architectural relics of its industrial past have been left intact, even peeled back further, with beams, rafters and brickwork exposed and co-mingling with its current use. This palimpsest history provides nooks and crannies and almost guarantees unplanned and chance juxtapositions between site and works, and also between works. Articulate describes the FERRET progressive exhibition as a dance, and from the first meeting of Ferret artists there certainly was the sense of an orchestrated sequence of interactions as we selected, vied, argued, bargained and collaborated on the spaces we were to successively occupy. FERRET has had some earlier incarnations. In a random, yet consistently furry play upon titling, the same exhibition concept was staged as FAIR ISLE (2014), followed by FERAL (2015). To FAIR ISLE is to knit while shouting, and there are a number of works that play upon and subvert notions of traditionally feminine and textile-related crafting in some way. By the front door is Anya Pesce’s Large Diagonal Fold revisited, a digital print on chiffon. It is stretched somewhat unnaturally across the wall, like a dress pulled taut. This tensile action emphasizes the hard horizontal edge of the image within, a red fold. It is an image of one of Pesce’s Fantastik plastik works, making a work that is an image of another work. It references softness and drapery as ambiguously as it does hard-edged abstraction. In another geometric abstraction overhead, Angus Callander’s Canopy consists of lengths of decorator cotton fabric, looped between exposed ceiling rafters, strikingly and minimally presenting the red/ green/black stripes as a counterpoint to the hardwood structural elements and driven nails that support its suspension. Meanwhile, at the back of the room and occupying the corner window alcove diagonally opposite to Pesce is a work that reactivates and revisits the red fold. Anke Stäcker’s work Nach Uns is also a digital print, this time on plastic, an enlarged image of folds within folds of pink and red plastic – trapping the crumpled, disposable media in a backlit image that vacillates between the bodily and the manufactured. Where this group of works just described softly deconstruct the material, Diane McCarthy’s mixed media works upstairs take the tactile, experiential and the textile, (including a powerfully bunched and coiled calico) back into the formal with a rectilinear triptych-on-the-wall presentation. The use of fluorescent light spills from and unites Martin Langthorne and Tim Corne’s collaboration, Colour Score and Star Grid, facing each other on the ground floor. From across the narrow room Langthorne’s motif of vertical bands of coloured light are trapped and projected anew by Corne’s layered and reflective rectangle of scrim and film, creating a light-changing shimmering curtain for the punctured constellation, the punched holes within the fabric. A relationship between another pair of artists[iii] is referenced and presented here as a collusion of coloured light falling upon and around the constellation of circular voids. Across and upstairs, systematic patterning is repeated in other works. As an organic clustering – my own work Inarticulations is a grouping of container-like objects - paintless paintings huddling beside and from exposed timber beams, deliberately avoiding the usual frontal and eye-line placement of painting. Directly above and visible as an echo through the unlined rafters is _____Hours, a spreading net of folded, shaped and taped White Pages: Business and Government by black3y3dpeac3, a pseudonym used by artist Mel Baveas. The data within her work is physically compressed, hidden and transformed within the hive-like construction atop the dividing wall. Both these works appear likely to spread and increase over the course of their occupation. The liminal boundary of spatial enclosure is defined again with Catriona Stanton’s The line between Us, a series of primary-coloured containers of air that scale the stairs. [iv] These porous containers are made from fencing wire, employed not to delineate boundaries (as fences do) but rather as objects to enfold space. Space as claustrophobic confinement is addressed in Kat Sawyer’s Pairs, digital prints that depict parts of human bodies fleshly morphed and somehow unfamiliar while in the process of fitting through and squeezing into various holes in materials[v]. Jacquelene Drinkall’s work Emergency Alfoil Anthrop are two video still prints, silent artefacts of a noise performance in another time and place, the environment of Witches Leap,[vi] a site of industrial extraction. Elsewhere, FERRET artists have utilised and recycled the ordinary, the found and the humble into constructed works that comment upon our contemporary human condition. William Seeto’s In a sieve we’ll go to sea is a spam-derived title which sounds like a fable but functioned as the starting point for the work, a playful assemblage of repurposed plastics and cardboard. The sea delivered Rox De Luca the material for her works, found pieces of discarded, ocean-washed and eroded plastic. From her collection De Luca has made two monochromatic hanging pieces, Mellow Yellow and Bluey that emblematise the paradoxical yet aesthetically lovely tragedy of civilisation’s waste. Upstairs, a Parramatta Road-facing window admits the heat of summer, strong urban light and traffic washed sounds of surrounding industrial Leichhardt. In a cardboard oratory nearby are works by Kate Scott and Lily Cummins. Scott’s A not quite unsightly enough ludic object (work in progress) is just that, a projection of play within a box, a world within the world. Cummins’ work is a drawn echo of this type of musing. In Last night I searched for you among the sheets, playful works on variously sized and cut cardboard are whimsically placed along, on and between a ledge and a white-painted brick wall, accentuating the process of drawing as a search to pin down the fleeting and the transitory. In a final gesture, and back downstairs you can have a discussion and see a chair plunged head-first into the floor. Emma Wise’s Housing Project invites audience participation in a map and a conversation as part of her ongoing research into accommodation in Sydney. In Retro-fit Linden Braye seems to pose the initial Dear Ferret artist position through her sculptural work. While we recognise elements of a chair, it will not seat us, it appears to be accommodating the stepped floor, or maybe it’s the other way around. We are thereby unseated and unsettled. Is to FERRET to make your art to fit or to fit your art into Articulate? [iii] The artists reference the relationship between John Cage’s musical composition and Antonín Bečvár’s star charts, Tim Corne and Martin Langthorne, FERRET 1 Roomsheet, Op. Cit. [iv] Catriona Stanton, artist’s statement, FERRET 1 Roomsheet, Op. Cit. [v] Kat Sawyer, artist’s statement, FERRET 1 Roomsheet, Op. Cit. [vi] Jacquelene Drinkall, artist’s statement, FERRET 1 Roomsheet, Op. Cit.